Frances is a close friend I met in college and an amazing human being. She's currently finishing up her two year Peace Corps service in Dominican Republic. But that's not all she's done. She's interned in Italy and Switzerland, traveled alone to Greece, taught English in China for a year, and well, you get the idea. As you can see Frances doesn't just travel to different countries. She lives and breathes their culture and that feeds her soul. On top of the world at Montaña Redonda in Michesad. This woman is my rock in Punta Caña (the village I live in), my loving, strong, intelligent, selfless host mother, Martha "Morena" Vicioso. She is seen here making the typical white cheese found around the country. This photo is just a snap of all the incredible things she does. She must have found a way to add more hours to the day because she never ceases to amaze me with all that she does. I could never say enough good things about Morena. She's the epitome of an incredible human. Living alone in a foreign country afforded me the opportunity to both befriend and rely on Morena’s wisdom and support. Baby Bill enjoying his rice and beans naked in a plastic chair. Hospitality and plastic chairs have become synomymous in the DR - if you're sitting in a plastic chair it is almost guaranteed that you'll be sharing laughs, super sweet coffee, and good times. My neighbor and best friend in site, Raybel, was able to participate in a medical mission that gave her a new prosthetic eye. In this picture she is finally looking at herself with two eyes and is gleaming at her own reflection. This moment of service was one of the most unforgettable and will be something I take with me forever. A new eye changed a little girls life, you can see her joy in this photo. Dominican Abuela lighting her cigar with burning wood directly from the fire used to cook the daily lunch of rice, beans, and if you're lucky, a little meat. Floating in the deep, clear blue… alone and peaceful. Playa Esmeralda- my favorite beach in the Dominican Republic. It is clear, blue, and completely isolated. You’re able to breath in the salty air without any distractions. 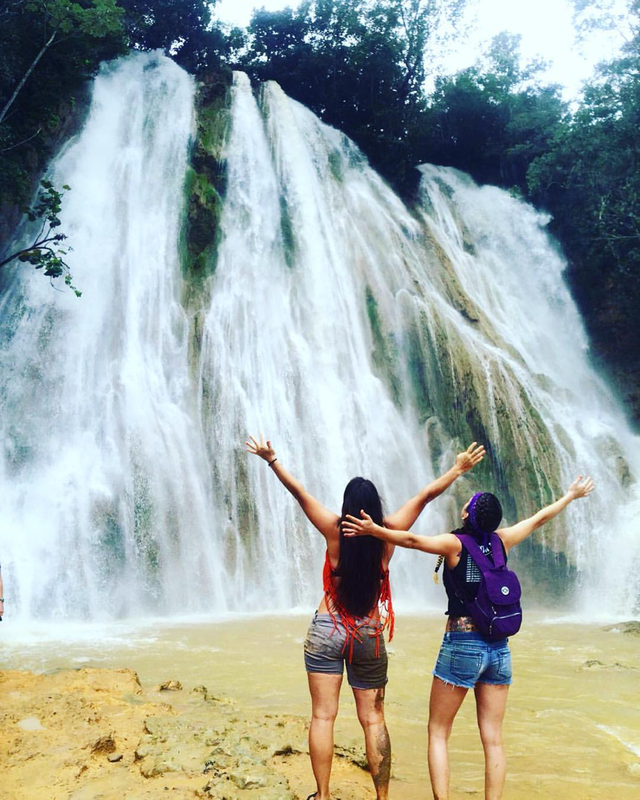 An hour hike up and down a muddy mountain is worth it when the end is Salto Limon – It’s a beautiful, powerful, and awe-inspiring waterfall near Las Terrenas, Samana, DR. Enjoying a beautiful sunset in Las Terrenas, Samana after a full day on the beach.